A Kuwaiti oil tanker was hijacked today by Somali pirates, off the coast of Oman. 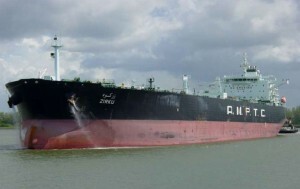 The tanker had a crew of 27 and was on its way from Sudan to Singapore. No word on whether the tanker was full of oil or not. Source: EU Naval Forces in Somalia. If you check the EU link, it mentioned its Kuwaiti owned.